Dear Customer, as per Govt. of India directive, you need to submit your Aadhar and Permanent Account Numbers for your Bank accounts. You are requested to complete the said submission at the earliest to ensure uninterrupted services for all your Bank accounts. 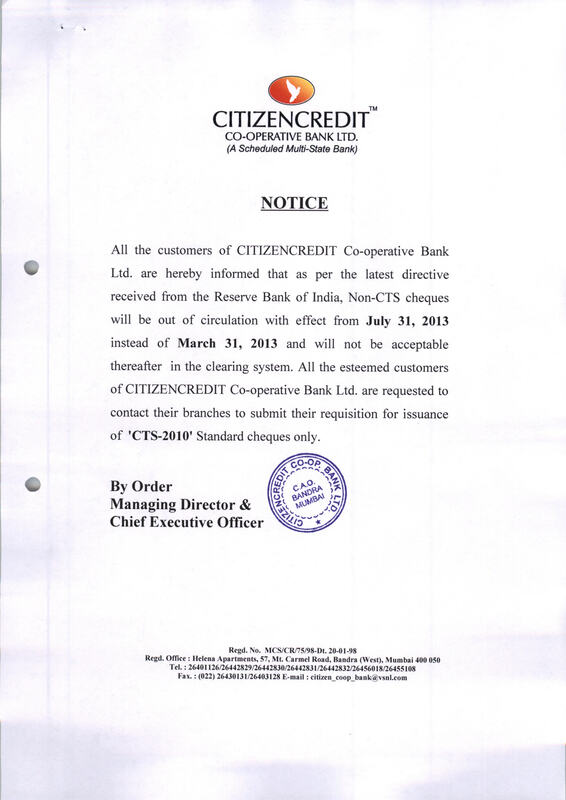 Meeting with Chartered Accountants, hosted by Citizencredit Co-operative Bank Ltd. This document is mandatory and binding on all the existing and new clients. Pls click on the above link to view the same. Accordingly any such instrument on or after 1st April 2012 will be valid for payment only upto a period of three months. Kindly make a note of this regulatory change in banking practice. SPEED-e Direct is a facility wherein you can directly execute your Delivery Instructions electronically online on the NSDL website. This would enable you to put through Delivery Instructions without having to submit them physically to the branch. Dematerialization and Rematerialization of certificates. Conversion of Mutual Fund units into demat form. Pledge and Hypothecation of securities. REQUIREMENT OF PERMANENT ACCOUNT NUMBER. Please note that the Finance Act(No.2) 2009 has introduced a new section 206AA with effect from April 01,2010 in the Income Tax Act, 1961. We are happy to inform that your Term Deposit will be renewed automatically. Auto-renewal is a separate and independent contract, at the Bank's prevailing interest rates on the date of auto-renewal, for the same period as the original deposit, till the receipt is presented for payment. Please preserve your original receipt.